‘With ‘Goldfill and Goldfill Pro,’ artificial turf becomes nature. 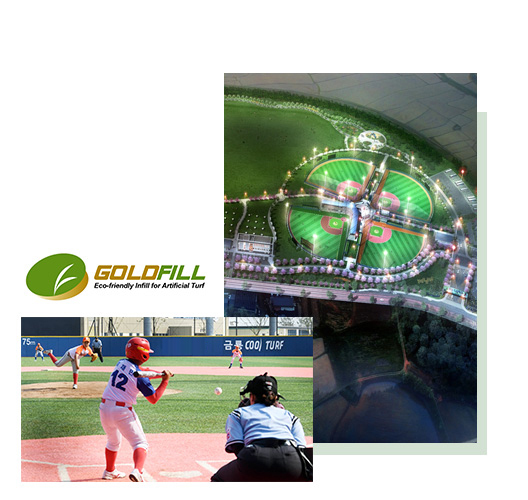 (주)Kum Ryoung has developed natural fillers named “Goldfill Pro” made by mixing rice hulls which are by-products from farm houses and ocher soil in order to reduce the bad effects of artificial rubber chip fillers and to create eco-friendly artificial turf grounds. Rubber chip fillers have recently become a social issue. We are now currently supplying our products to different customers. All members of the company will do their best to contribute to promote a clean and natural environment and enhance the quality of human life through endlessly engaging in R&D efforts and improving technology based on new environment-friendly technological advances and will try to make our company an upright and honest enterprise that conducts itself properly based on a sincere and thoughtful mindset.